It feels like you are in another world – the lunar landscape and unique geological features are like nowhere else, but it does not take too long to get there – great if you have a fidgety 9 year old who frequently asks “How long left?” Our flight from the UK took less than 2.5 hours, it is also not that far from the States. We found ourselves wondering why we had never been before. Hopefully we will stopover in Iceland on the way to the USA in future, thus shortening the journey and making our 9 year old more bearable. There are so many playgrounds scattered around Reykjavik and all over Iceland. This means you can do a little bit of sightseeing, then let your children let off a bit of steam and run around. Icelandic children play outside whatever the weather – they spend a few hours playing out of doors come rain, hail or snow. A great way of thinking! Many Icelandic people used to (and apparently still do) believe in elves. Lots of gardens have wooden elf houses in them and if you go to Hafnarfjordur, you can say you have been to the “Elf Capital” of Iceland. Here, they will not build a house or make a new road until they have established there are no elves living there. Our 9 year old was captivated and enthralled by these stories. Even on a walking tour of Reykjavik, the guide mentioned the elves and pointed out places where they live – magical for children. Don’t worry what the weather forecast says – bring your swimsuit, you can take the kids swimming outside even in a snowstorm. Every town has its own outdoor hot pool with warm water and everything is so clean and family friendly. The changing rooms are great too. Laugardalur is the most fun for kids in Reykjavik – an outdoor pool with slides, inflatable toys and Icelandic children who are friendly and you can play with. Lots of the attractions have free entry for children below a certain age, most places have significant reductions. 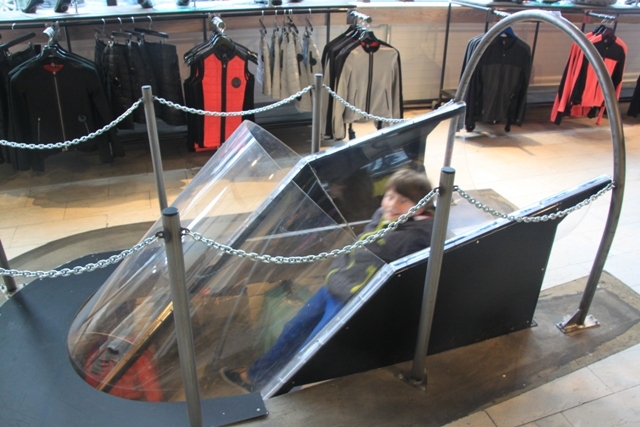 Many museums we found often had really good play areas and activities laid on for children. It is amazing here, even the most cynical child will be blown away by the vast array of natural wonders. Black lava fields stretching as far as the eye can see, glacial lakes with the purest water you can drink straight from the lake, volcanoes, crashing waterfalls, spouting geysers, bubbling hot mud pools and more, so so much more. Even fields of stone piles where you can get out and add your own creation should you so choose. 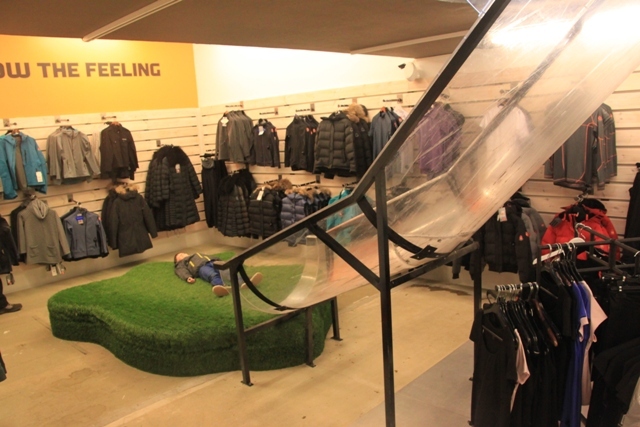 Check out how you can get to the basement in this shop – that is the thing about Iceland, quirky and even the shops know how to keep kids happy. Layering is key here. Our 9 year old really did feel the cold, so had to wear several layers on the really chilly days. The weather can also change in the blink of an eye – I have never seen anything like it. One moment it is icy cold, in an hour the sun is shining and you feel hot. It is so important to be able to shed the layers easily. A waterproof, wind tight jacket is a must. You also need comfortable boots, sunscreen and sunglasses. Our son often got his boots absolutely soaked and it took a day for them to dry out. Bring a spare pair! There are lots of websites about the elf belief in Iceland and also lots of great children’s books. Read these and check them out before you go – our 9 year old did and was so excited about the trip. Down by the harbour are some really nice (very expensive) restaurants, but we struggled to find anything our picky kid would eat. Further up the main shopping street are some great, smaller places – still fantastic food, much more reasonably priced and with great kids menus. There are no chains in Iceland and everywhere serves fresh, top quality food. Be prepared – 24 hours of day light does not make it easy to get kids to bed. We really struggled with this one – our 9 year old was bouncing around at midnight every night – I don’t know the answer, we didn’t really find a solution, but if you know about it in advance, at least you can plan for it! How cool, great to know for the future! This is a great list. Sadly, Iceland is not so close to Australia so if we get there it might need to be a stop-over on the way to somewhere else, as you suggest. Definitely worth keeping it in mind for the future – it’s an amazing place different to most everywhere else. My kids thought Iceland sounded like a fun place to vacation some year. Your posts make it sound feasible someday in the future. But our next big trip is already being planned….Montana and Wyoming! It’s definitely a great place for a family holiday, but Montana and Wyoming – sounds fantastic. We visited both places before we had our son and would love to bring him back there – looking forward to reading your blogs about the trip!